"Resolutions are rarely kept, and goals are easily forgotten; but, ONE WORD sticks!" If I had done this last year, my one word would have been easy to decide: PERSEVERANCE. This past year (2013) has probably been the most difficult year of my life. Not just because of my cancer (although that played a BIG part), but from various other reasons as well. Yet, I held the Lord's hand through it all and persevered under trial. To find my word for 2014, I took a little time to reflect on the past year and then pray about what my word should be for this year. It finally came to me. My one word is PURPOSE. ONE WORD can create "clarity, power, passion and life-change." It can also takes the stress out of trying to live up to a New Year's resolution. Yes, goals are good, and should be considered. But, with just one word to remember, I can think about it through-out the year to help bring me back into focus when its needed. Give it a try! 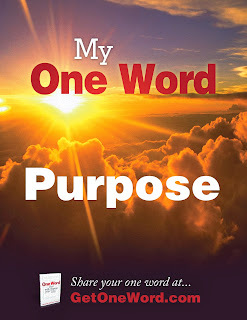 And, if you decide to do it, I'd love to hear what YOUR one word is for the new year, too! Genesis 2:18 - Then the LORD God said, "It is not good for the man to be alone; I will make him a helper suitable for him." Deuteronomy 6:7 - and you shall teach them diligently to your sons and shall talk of them when you sit in your house and when you walk by the way and when you lie down and when you rise up. Psalm 100:2 - Serve the LORD with gladness; Come before Him with joyful singing. Titus 2:3-5 - Older women likewise are to be reverent in their behavior, not malicious gossips, nor enslaved to much wine, teaching what is good, that they may encourage the young women to love their husbands, to love their children, [to be] sensible, pure, workers at home, kind, being subject to their own husbands, that the word of God may not be dishonored. 1 Thessalonians 5:11 - Therefore encourage one another, and build up one another, just as you also are doing. Hebrews 3:13 - But encourage one another day after day, as long as it is [still] called "Today," lest any one of you be hardened by the deceitfulness of sin. Thats a great One Word. Mine is: Vreugde ( Joy).